Sohan Dutta joined the Brindavan Campus of the Sri Sathya Sai Institute of Higher Learning in 2002 for his Bachelors in Sciences (majoring in physics). He then pursued his Masters in Physics in the Prasanthi Nilayam Campus of the university. After a brief interim stint in the corporate world during which he worked with one of India’s reputed software companies, Sohan rejoined Baba’s university in 2010 for his Masters in Business Administration (MBA). He is currently employed with Abiba Systems (Bengaluru) as an Assistant Project Manager. It is noteworthy that Sohan was named as one of the Top Young Leaders in India by The Economic Times (one of India’s leading business newspapers) as part of The Economic Times Young Leaders Programme 2012. This programme is a platform for recognising and rewarding India's most promising young managers. Only 28 out of the staggering 17,000 applicants were conferred the top honours in 2012! In a one-on-one conversation with Radio Sai's Bishu Prusty, Sohan tracks his journey to Baba’s University, his learning there, his deep-rooted convictions, his decision to return to Prasanthi Nilayam campus, his novel service initiative and the most cherished moments of his life. 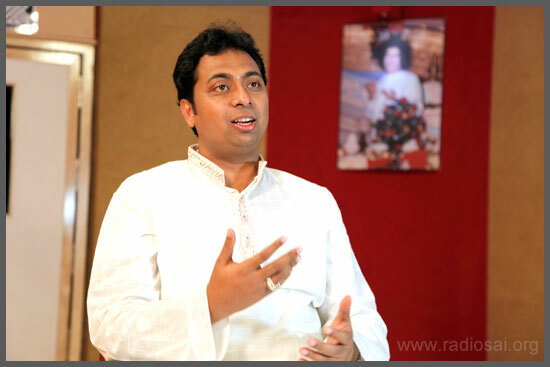 This conversation was originally done for the Radio Sai series “Fleeting Moments, Lasting Memories” in October 2012, immediately after he received the Top Young Leader Award. We are happy to present the edited excerpts of this conversation now when the Department of Management Studies, Prasanthi Nilayam, celebrates its 26th anniversary. Baba started this department on August 21, 1986. The experience of being interviewed by Mr. Nitin Paranjpe, the Managing Director and CEO of Hindustan Unilever Limited, in the last stage of ET Young Leaders Programme. Sohan Dutta: It was an enriching experience. I felt lucky to be in front of him because I felt that his value systems resonated with what has been embedded in us during the student days at Baba’s university. Somehow, the thought of winning was not in my mind in those 40 minutes. I was just enjoying the whole experience. One of the things I spoke about was the application of our value system in the corporate world. I feel this is what makes us different from many others. Here is a simple instance. I was working with this IT company. A client had decided to buy a new release of one of our software products. While doing the testing, we found out there were some bugs which most probably the client would not notice or find out. But I went ahead and informed the client about these bugs and also assured them in the same breath that we would fix them in quick time. This helped us win the trust of the client and in the long run we got many more projects from them. Trust is an invaluable asset whether we are talking of business or personal life and Sathya or Truth is the foundation on which this is built. The best part is when I was sharing this, Mr. Paranjpe took out his notebook and started making notes! There was another interesting thing that happened before the interview. It was scheduled at 11 AM in Mumbai and I had to travel from Bangalore. I had a 6.15 AM flight which was scheduled to reach Mumbai at 7.45 AM. That would have given me enough time to get ready, change into formals and reach the venue. But after boarding the flight, to my dismay the pilot announced that due to bad weather the flight was unable to take off. It therefore was grounded in Bengaluru airport for two hours! So instead of reaching Mumbai at 7.45 AM I was there at 10.00 AM. I dropped all plans of going to my relative's house to freshen up and headed straight to the venue. Even though new to the location, I managed to be there just five minutes prior to 11 AM! So here I was, going into the washroom to change into formals because I was in jeans and jacket, and carrying luggage in my hand. But suddenly, the door of the conference room opened and Mr. Nitin Paranjpe emerged calling out my name. I was caught totally unprepared. I explained the situation to him. He thankfully agreed to give me a few minutes to change into formals. But as I was walking towards the washroom now, he called out my name again and suggested that we should go ahead with the interview immediately. So I did not have any other option but to go in for such an important interview clad in informal wear and carrying my luggage in my hands! Looking back at this episode, I feel it was yet another instance which clearly showed the benefit of the training that Baba has put us through during our student days. I was reminded of my post-graduation days when Swami would suddenly ask for a programme or a drama to be staged in the Mandir and we had to get this ready in two days. So script-writing to making costumes to creating sets to rehearsals – everything happened in 48 hours! So thanks to the years spent in Baba's college, all this confusion prior to such a significant interview did not unsettle me. Actually due to various preoccupations I couldn’t really prepare for this interview as much as I would have liked to. So I used the time allowed by the two hour delay in the departure of my flight to reflect upon the words 'leader' and 'leadership'. I looked upon the word ‘leader’ as an acronym and tried to assign a word or two to each of the letters. I began with the first letter ‘L’ and felt it stood for ‘Love for the work you are doing’. Until and unless you are passionate about what you are doing you will not be motivated yourself and will not be able to motivate your team too. Maybe in the short term the pay you are receiving can motivate you but in the long term, it is the love for the work you are doing that would really help you to motivate yourself and others. The second ‘L’, I think, should stand for ‘Learn’ because learning is something we need to do on a regular basis or maybe every moment! If someday a person thinks that he knows everything, that is the day when his/her growth starts taking the downward trajectory. As a leader you should never feel that you can’t learn from your junior or your peer lest they look down upon you if you do that. Next letter is ‘E’. The two words that come to my mind are ‘Empathy’ and ‘Egolessness’. Many a times, people treat empathy as a synonym of sympathy. But this is not so. Sympathy is ‘feeling for a person’. Empathy on the other hand is ‘feeling what a person feels’. Being empathetic is very critical in the corporate world. When you empathize, you understand your peers, your juniors and your seniors better. You understand your clients and their expectations better too. You also understand that a business survives to serve its clients and the society at large. Each action is then taken keeping in mind the good of all. Happiness is now ensured. Then comes Egolessness. Many a times in a corporate setting, you get into discussions seeking to find solutions to certain organisational challenges. In these situations, unless you learn to outgrow the small ‘i’ you would never lend your ear to ideas suggested by others which might actually be very good for the organisation. Next comes the letter ‘A’. To me, they stand for Acumen and Attitude. Business Acumen is something very important regardless of whether you are running a small business or a billion dollar empire. Acumen implies the ability to take a holistic view of how each of your actions would affect every stakeholder, not just the shareholders. This would enable you to take decisions keeping the overall welfare of all in mind. Acumen also includes the ability to get to the crux of things, identify the few key basics of the business you are running and in turn simplify matters which would otherwise appear complex. Whoever can do this, would find it easy to guide people and would surely make a good leader. Then comes Attitude. Attitude is something which is very contagious by nature; if you have a positive attitude you inject a similar attitude into the people who are working around you. Maybe this process would take time, but it is bound to happen at some point. I have experienced this. Many a times in the course of my work I have come across situations where you close an issue only to find many more opening up! And in such situations you are under the pressure of an impending deadline and related challenges. It is quite natural in these scenarios to start believing that things are not going to work out. But my experience has taught me that maintaining a positive attitude in such situations helps us to explore alternatives, think out of the box and eventually come up with solutions which we never thought were possible in the first instance! 'D' stands for Direction and Discrimination. When do we feel the need for a leader? When there is uncertainty about the future and ambiguity in the environment. In these situations you bank on someone who is able to connect the dots and give us a clear sense of direction; someone who is ready to take calculated risks. The leader is someone who would give credit to his team for all successes but would take the blame of a failure squarely on himself. This, a leader can do only if he/she learns to put the larger interest ahead of self-interest. ‘D’ also stands for ‘discrimination’. Simply put, this would mean choosing what you think is the right course of action over what you think is wrong in a given situation, regardless of the ramifications. It involves listening to your conscience and keeping the core human values as the undercurrent of whatever you do. It means keeping in mind the long-term goal and long-term benefit rather than the short-term gains. This can be challenging because sometimes your entire team might lose something in the short run. But that is when Baba's message on leadership comes to the rescue – 'To Be, To Do, To Tell'. Preaching is very easy. But if you can practice what you are saying then it has a huge impact. When you lead by example you build credibility with people around you, then they slowly start trusting you with decisions which on the face of it may have a downside to it. Personally, I am very lucky because whenever I am in a dilemma, I leave things to Baba and somehow He guides me through it. Infact this was my approach even for this interview. At one point, Mr. Paranjpe asked me, “If you win then what?” I said, first I would offer the same to Swami. Second, to the Sri Sathya Sai Institute of Higher Learning, the teachers there who put in so much of effort in grooming me. And the third dedication would be to my parents. But then if things work out otherwise, I told him that I would just carry on with my life, and continue to work towards the goals of my life. So whether I win this or not, would not make a big difference to my life. Coming back to LEADER, ‘E’ signifies Empowerment and Enthusiasm. When you are leading a group of people, I believe it is not enough if you guide them. It is also the responsibility of the leader to help each member of the team to grow. And here is where empowerment comes in. Because when you empower people and give them more responsibilities you help them grow. So it is not just about getting things done. It is also about helping people to grow in their career paths. Then they will feel more into the work, and feel attached and good about it. That will give them immense job satisfaction. At the end of it they are very happy. I am too happy as I had played a small part in helping them grow. The second ‘E’ is Enthusiasm. To me, enthusiasm is very important in any team effort irrespective of where the team is and what it is working on. The enthusiasm with which you work as a team makes a lot of difference because when you work as a team with full enthusiasm, synergy comes into play. Then 2 + 2 is not 4 but 5. Finally R stands for Responsibility. People talk about ‘rights’ but they forget about the responsibilities that comes along with them. When one discharges one's responsibilities diligently, the rights automatically follow. Last but not the least, ‘R’ also stands for Righteousness. Dharma, honesty, integrity… all these things make huge difference. Maybe you can accumulate a lot of money but it is more important that at the end of the day you get a good night’s sleep. It’s not important how soft the pillow is or what is the colour of the mattress; even if you are sleeping on the floor you should have sound sleep. Also, talking about the ‘ship’ in ‘leadership', a leader should have that capability to show his or her innate potential. Thus ‘S-H-I-P’ stands for ‘Show His or Her Innate Potential’.